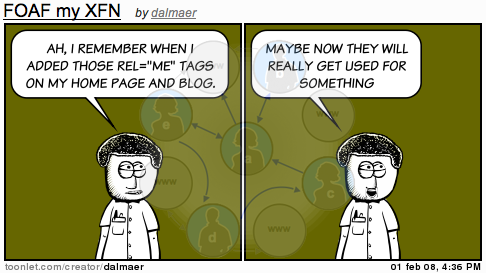 Google Social Graph API Released Silveryahoo: Don’t you want to see Yahoo! Silverlight Mail? I don’t know about you, but I did this. I went through my site and added a bunch of XFN. I had run rel‘ing away. It didn’t really do much for me though, it was always a promise of an open format. I played with a few tools, but I largely forgot about it. When I add a friend in Facebook, or Twitter, or …. I see immediate effect. I am really hopeful that the Google Social Graph API and other efforts change the equation though. This is only the beginning, so who knows where it will go!